Shiny, metallic blue or green; 1/4″ to 3/8″. 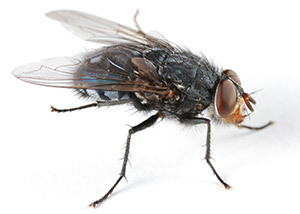 Fly control is challenging because their larval sites must be located and eliminated for success, and these sites may be some distance from where the adults are a nuisance. Throw trash away in trash cans in plastic bags, and locate trash receptacles as far from the building as possible. Keep doors and windows closed unless they are equipped with a tight-fitting screen. While a dead animal behind a wall or in a crawlspace is not always easily found, if you suspect a dead animal it must be removed to avoid attracting these flies.